In this article, we explore some of the most helpful add-ons for Elementor, developed by several talented third-party developers. Elementor is an extremely extensive plugin, especially if you compare it with other single-purpose plugins like Hide Comments. With it, you have the ability to manage a wide array of WordPress functionality. This includes customizing your sites images, forms, sliders and so on. Even though you can do a lot with our plugin, some functionality is bound to be left out. This is where 3rd party plugins come-in handy. While our internal team has to stay focused on our roadmap and key developments, external developers can more freely sidetrack and develop imaginative features, like a typing effect headline for example. Extending Elementor is something we are very interested in encouraging. That’s why we invest a lot of efforts on helping add-on developers in various ways. These include releasing a well-documented API, creating a beta-tester group and engaging in responsive communication with other developers on our GitHub page. I’m happy to say it worked. Today there are numerous helpful Elementor addons out there. These add-ons have been created by highly skilled developers, who dived deep into the core of the plugin and expanded it further. We have seen a growth in the number of add-ons being developed for Elementor. More and more developers seem to pose an interest in joining in the fun and develop something new. 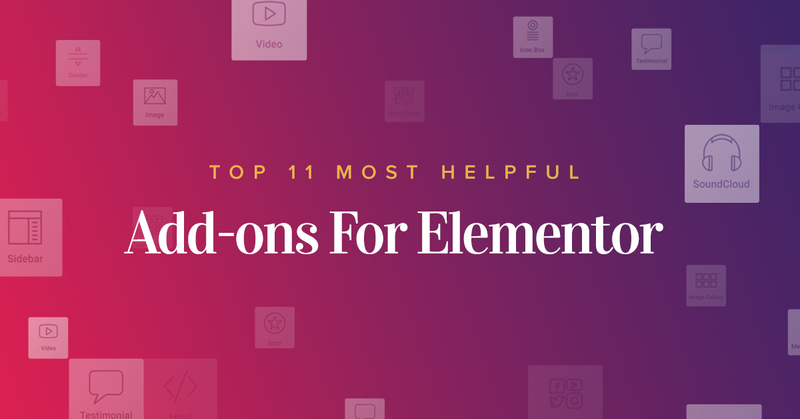 Today, I’d like to go over 11 of the most useful Elementor add-ons already developed, all of which come in handy for a variety of purposes. it a useful addition to your toolkit. MotoPress is one of the earliest page builders for WordPress ever created. That’s why we were pleasantly surprised that the team behind MotoPress decided to integrate their Hotel Booking plugin with Elementor. This way, users get a more user-friendly toolkit for building your property rental website visually. You’ll be able to see all MotoPress Hotel Booking shortcodes and widgets (e.g. search availability form, rentals listing, etc.) in the list of the content modules in the Elementor builder. Press Elements, from the founder of GenerateWP allows you to add certain site elements into Elementor. These elements include the site title, description, and logo. You can also add site counters, which are site stats like the number of posts in your site. The plugin also lets you add certain post elements, including title, excerpt, date, author, terms, featured image, custom fields and comments. Inside Press Elements you have further features, including an Image Accordion, a Before After Effect slider and a sticky notes display. Finally, it offers Elementor integrations to ACF, Gravatar, Flickr, and Pinterest. Anywhere Elementor offers the same functionality of one of Elementor Pro’s features. This functionality allows you to embed template shortcodes. With this plugin, you can save templates, and then embed their shortcodes anywhere in your site, including inside other Elementor pages. AE, as it is called in our Facebook group, also has a pro version. This version includes some interesting features like creating multiple post layouts, adding individual post elements, creating hooks to GeneratePress and OceanWP, WooCommerce Category & Single page product layouts and more. Elementor Contact Form DB stores your form submissions. This way, all the leads and submissions that are submitted to your site are logged into your site. Instead of just sending them to your email, you always have a backed up submission list for your leads. After you install this plugin, all Elementor form submissions will automatically be saved to the plugin, with no extra setup needed. WooRocks Magic Content is a handy plugin for membership sites. With this plugin, you can restrict access to sections, and only allow access to logged in users, specific user roles or to logged out users. * Update – We’ve been told this plugin caused the site to crash so we recommend to try it first on development sites alone. More Responsive Tablet 4 Elementor gives breakpoint control for tablets, so you can decide just how your website will look like on Tablet devices. Elementor has this ability for mobile, and this plugin extends that control for tablet devices as well. Once you install the plugin, you will be able to see it in the advanced table under the column setting. There, you can set the device column width on tablets. SiteOrigin’s Widgets Bundle was originally created for SiteOrigin’s page builder plugin. It has recently been re-released with an updated version, adding built-in Elementor compatibility. This means you can use every widget in the bundle within the Elementor editor. This includes the following widgets: Google Maps, Button Widget, Image Widget, Call To Action Widget, Slider Widget, Price Table, Post Carousel Widget, Features Widget, Video Widget, Headline Widget and Social Links Widget. Addon Widgets is a popular plugin that has been developed by one of our top community members, Zulfikar Nore. This developer, apart from creating plugins, has been also active helping answer countless questions asked by the Elementor Community group on Facebook (If you are reading this, thanks buddy!). This plugin adds several native WordPress widgets. These include WooCommerce Product Categories, Recent Products, Best-Selling Products, Featured Products, On Sale Products, Popular Products, Recent Posts and Posts By Category. 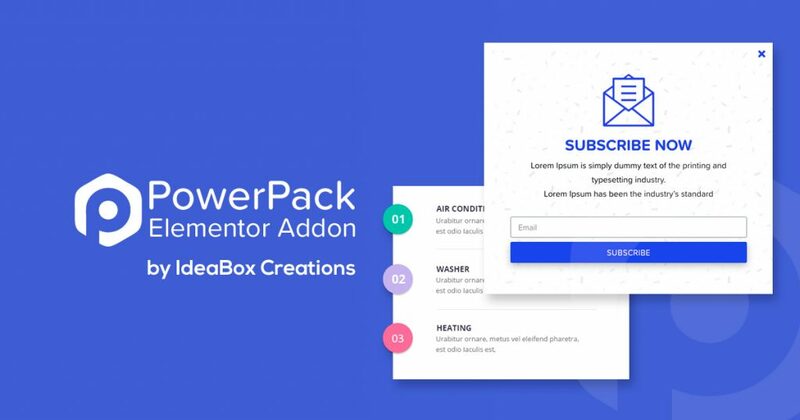 Addon Elements is a great addon that adds several widgets to Elementor, including Flip Box, Text Separator, Price Table, Post List, Animated Text and Split Text. Out of these widgets, I personally liked best the Split Text, which lets you add a single headline with two separate styles. I also found the Animated Text useful, as it lets you add a headline with a typing effect. Void’s plugin is really hot off the press, but the developer pinged us so I tried it out. With the Void plugin, you have 5 options to display your posts: Grid Layout, List Layout, 1st Full Post then Grid, 1st Full Post then List and Minimal Grid. Out of these options, I found the most useful to be the ‘1st full post then list’ layout, because this is a popular grid for blogs. With this layout, you can showcase the first blog post as large, taking up the entire section, while the rest of the posts are displayed in a list. As Elementor is growing and becoming a household name, we see a growing need for creating integrations with other WordPress plugins as well as external API services. Already, professional developers and plugin authors like Codeable have created an amazing assortment of plugins and solutions, expanding Elementor further. We have made an effort in that direction ourselves, recently releasing form integrations to MailChimp and MailPoet. There is, however, much more integrations developers can create. Conversion optimization tools, email services, WordPress plugins… Creating integrations is by far the best contribution possible for Elementor, at least from our standpoint. It has the potential of helping thousands of users that are searching for a way to combine Elementor with their favorite online tools. A special mention has to go to Rami Yushuvayev, the developer of Press Elements that was mentioned earlier, who created several useful integrations like the Pinterest integration. Before I close, I want to remind you these are all third party plugins built by external developers. If you run into any issue when using one of them, please contact the developers of the plugin. I am sure they will be happy to help. I hope you’ve found some useful examples of Elementor addon plugins for your website. If you are a developer and want to extend Elementor yourself, please visit our GitHub page and our API documentation to get started. Thanks Ben, I appreciate the mention. Elementor is an awesome tool. I predict that next year there will be dozens and maybe even hundreds of 3rd-party addons. Thanks for mentioning Press Elements. When you going to add some add on fpr woocommercw? Thank you for the mention Ben. I don’t think we could have achieved what we have if it was not for the great support from you guys – from advice, enhancements and the API, you’ve done an awesome job in every department. Hello and thanks for this article, i’m looking for a solution to customize my sales form coming from woocomerce like i do with a normal from with elementor …. do you have some tips about it ? Thank you Ben for the More Responsive Tablet 4 Elementor mention. So proud to see my plugin in this post. That’s amazing, there are some very useful plugins on the list! I was wondering if there is a space for premium (paid-for) plugins in the Elementor community? And what would be your official stance toward something like that? Absolutely awesome! Thanks to those other developers joining the party. Excellent article. Elementor is becoming truly revolutionary within the world of web design. Thank you all guys! (hey, ladies what about you?!?) You make our lives easier & help bring our ideas to life! Yellow Pencil plugin is perfect with Elementor! yep, some cool stuff out there. but not sharing all of the enthusiasm… meanwhile one have to take care not to double or even triple possibilities and available widgets. further on some addons seem to be a little bit pricey in pro versions, compared to elementor itself. and while some seems quite redundant imho -like site origin widgets- there are the really promising ones like stylepress. sadly the latter seems to demand for kind of long lasting breath – theres obviously still no production-ready version. but as i hoped quite a year ago – theres not much left other builders offer still more and yet elementor and friends already quite overtook its competitors. One of the best page builders out there, for FREE! Getting a database error at this momnet, just fyi. Prob just random or something? Thank you for all the cool information, i LOVE elementor personally. It is really very helpful plugin help out there for free. I’m hoping this is on your roadmap for a future release! I’d like to see an add-on which provides text in columns which reflow as the screen width changes … between devices or if browser width is changed. I’ve never seen anything like this … all the column plugins I’ve seen set column breaks in the text. This is not something I think we will be releasing anytime soon. I like Elementor, but I’d like to see a “timed” section capability. I can do this in WordPress with short codes, but it doesn’t work in Elementor. hi, i was really into pinterset and instagram integration with elementor. Hey, that’s great and all… but I’ve been trying Elementor excessively for the last couple of days and I came to understand that although it’s a powerful tool, it’s been designed for creating almost exclusively nice eye-catching Landing Pages. I’ve been experimenting with both GeneratePress and OceanWP themes as they are recommended. I’ve also tried every Elementor plugins/addons available in the WordPress repository but to my disappointment, I saw that they are also mostly Landing Page friendly and did not add much value to me. The type of site I’m trying to build is a kind of blog, you could call it, which I’d like to design as impressive as I can, so I thought I’d try Elementor. So far, I’ve found it very difficult to create a nice layout for my blog since Elementor offers almost no customization in its Blog Posts very limited layouts. Create a “Home” page with Elementor with a big nice header and customize it as I like and then add the Blog section of the theme underneath in the same page, since the site is a blog and not a landing page, so the theme’s style with the sidebar etc. would do just fine. I also contacted the theme’s author but he could not provide me with a solution since this is mostly based on Elementor rather that the theme. I would like to hear your thoughts about all this and if you think such functionality could be added in Elementor. In other words, an option inside Elementor to be able to diversify and be able to choose whether you would want to use the theme’s styles/layout or Elementor’s when adding a section. And also of course if there is a way to achieve what I described above. Please let me know here or to my e-mail. Sorry for the long comment. I’m just saying, adding a way to also support the theme’s default style inside Elementor instead of overwriting with Elementor’s styles would be great. I prefer OceanWP’s widgets over Elementor’s posts widgets, that’s why I ask. Bottom line is, I think Elementor would be a lot greater if it’s built/updated with Blogs in mind and not mainly landing sites. We will expand this functionality in the near future. That’s great to hear, I’m looking forward to it! … have yet to see if it works with Elementor. I’m really surprised more people haven’t thought this a good idea! This got me confused as well. I mean..
You can’t edit/customize the Header and Footer just with Elementor? Isn’t that a bit basic? Hey guys, just wondering… I know there is a revision history option but adding an undo function by just hitting CTRL+Z would come in handy. Do you think you add this in a future update? For SiteOrigin Widgets Bundle to function in Elementor you need to install SiteOrigin PageBuilder plugin as well? Why Embedding Instagram url is not working on your builder ? I’m with Mel. While I’m familiar with Pros offerings, the plugin list was confusing as to whether they benefited Pro users or Free users. As best as I can tell it appears to be a bit of both. I’m sorry for the confusion. You are right, they are a mix of both. Kudos for the Elementor Form DB plugin. I work at EZtouse.com and I’ve migrated the entire web development department over to Elementor. I’ve hated having to use other Form plugins only because they store info in DB vs just email it. The Elementor Form Builder is beautifully designed so this plugin makes life awesome. Also, highly recommend StylePress plugin. Our developers had to build a theme using underscore/understrap for every site we put out, now it’s Elementor / StylePress & whalla. I’m already using Elementor for a few months and for me it’s the best of page-authoring plugins. 1. Can I set filter on pojo/elementor widgets? if yes, how? api? 2. Is there API with hooks on elements, columns and areas? 3. Social links element does not provide sharing-page option. will you provide it ? I am in love with Elementor Pro!! But you should take out the plugin WooRocks Magic Content. I tried to install it twice and it creates a total crash of my website. Other users report the same problem. Sad, because i would really need something like that. Is Elementor planning to create something like that? Thanks for everything and go on with your great work. For any page builder, I think this is the best addon package available in the repo right now. Ben, is there any way to use Elementor to style or customize Category and Archive pages? Very very nice plugin, so useful. Get a elementor template for post and archive is the last task to be perfect ! which comment box works best with elementor plugin? I designed it with ninja forms, although unfortunately Ninja form doesn’t allow you to publish people’s comments. I integrated that comment box because the default WP comment widget also doesn’t allow for comments to be public. Is there any other plugin or tool, suitable for elementor, that allows for comments to be public? Agree with you Romeo, That would be a feature to add that would make Elementor perfect! Is there any intention to integrate this powerful feature? Hey Ben, not much of an active poster, but I’ve been a “new” user of Elementor Pro for some months. I’ve played a lot with the major part of “visual” builders out there, but there is just something in the way you guys do your UI that is so very much pleasing! Not to say about the very thorough options for each module, where you can practically customize every single aspect of them. Bravo, bravo and again bravo! – Also, is there any intention for you guys to be able to let Elementor give shape to Archive Pages and other “Native” WP templating? – Finally, I’ve skimmed through the comments, and not sure if I understood correctly: you are talking about an Elementor Pro “marketplace” existing somewhere? Am I correct? Where can I find it? Thank you so much, and keep up the great work guys, all my bets are on you! PD: Sorry for the lengthy one! I would love to see this functionality also. If they could access the page and only gave access to one section which contained the content of the post. Then they could write text and drag in a clickk to tweet if they want. But they won’t be able to access any other part of the page. That would be Amazing.! 1) what the difference is between header footer elementor and style press if they both allow you to custom design the elements outside of the body. why would you need one over the other. 2) as well since I have elementor pro, why do I need header footer elementor? can the same function not already accomplished using the nav menu pro feature? another thing, I do not see the embed anywhere feature ben was referring to, please advise. Wow. “Sofsof” i am waiting for super fast, light weight, theme to host elementor. But if you finally integrate wordpress theme with Elementor “templates” that is even better. Thanks for that, Ben! Are there any plans to create an image map widget so that a pop-up window is displayed when the user hovers over an image? or does it already exist and I’m not aware of it? I love using Elementor, however, it is still seriously lacking in the forms area. I use Mailster for my mailing lists but there is no way to implement it other than custom html, but that leaves zero control over how the form actually looks on the page. Most of the other page builders have a form code parser in their form builder where you can enter third party form code and it parses the fields into the form giving you full control over the design. The form designer works great, but I don’t use MailPoet or MailChimp, so that makes it basically useless to me. Hi! I am about to use press-elements, which I find great. But I have juste noticed that was last updated 6 months ago. Is that ok? or it have been stopped for development? Nice article BTW, do you keep updating it? or may be there is a 2018 versión? What a discovery! Totally love Elementor. Work With Divi since years but I am sold! So I decided to leave Divi for Elementor BUT my major problem: I don’t want my clients to use Elementor at all! They will edit the pages in the normal WordPress editor only. So I would like to make sure we can get rid of the button “edit with elementor” on the pages and posts and also remove all access to Elementor theme – customize – header – footer and all from the WordPress left menu. I delivered one site a week ago I designed with Elementor. I know the client since a long time so I trust him that he will not play with it but I don’t trust other clients not to play with it and then ruin the whole design. Until here is a way to hide all access to Elementor I will not dare to give the site to new clients. So please is there a way to do that or is it planned in the near future? Editor roles. Major addition. And may be one day a white label plugin .. ? Are there any plans to add some more post grid options? I would really like a post carousel but the one I am using with elementor addons does not look or work that well. I would prefer not to have to rely on outside addons. Would really appreciate if you can add Widget Options for WordPress : https://wordpress.org/plugins/widget-options/ . This is a plugin of mine and I’ve added Elementor Integration Support last year and it’s working perfectly. Let me know your thoughts. Next time we publish an addon plugins recap I will be sure to include it. Can you recommend any 3rd party plugins for Elementor that renders from a data-source? It would be really neat to say, iterate an JSON array and populate and Elementor template with data. You’ve done a great job with Elementor by the way. Love it! I´d like to know how can we upload a video from the library, not youtube neither vimeo. Thanks a lot! Ben – Pls include our popular plugin too – Free version – https://wordpress.org/plugins/addons-for-elementor/ and premium one – https://www.livemeshthemes.com/elementor-addons/. Thank you. Hi Ben, Does the newly released elementor theme builder replace studio press? (Also, the studiopress website is down — perhaps this is being discontinued?). On another note, is there any add-on that will help us to display events (they are actually posts, but they are sorted by event date). We are not replacing anything. We are building the future. Is there an update on this request? I’d love an Elementor ‘Print Recipe’ feature of some kind. I already had the feeling when I tested Elementor for the first time about a year ago: this baby was going to make its way to the top. And what do you think everybody? It’s done it! Right? I do have to make a shoot out to a small company: Namogo, which makes a very nice set of add-ons for Elementor that is focussed to make Elementor a bit more enjoyable to interact with on the front end (parallax “anything” for example)… They really deserve a mention IMHO. A wish for the future Elementor, and maybe I’m being delusional (just woke up, cope with a noob please hahaha), but maybe having breakpoint visual interface in the builder to really have fine (visual) control over your layouts for different screens would be the bomb! How do I plug in recipes using Elementor? I currently use WP Recipe Maker. can not integrate the jatpack with the elementor, this page is integrated here, and several tutotials that assists the elemental has an integration. I love your builder but it seems a lot of plugins I install aren’t working with it. Elementor Addon Elements you recommended doesn’t seem to be working. I get a page not found. We try to be compatible with as many plugins as we can, but sometimes bugs occur. Try to contact the author of the plugin. To me this means on the positive side that it’s obvious that the Elementor crew keeps an tuff rythm of work in order to make Elementor better and better. The downside of course is that some of these third party providers are having a hard time keeping on with that Rythm. I still would like to check other third party providers to eventually find one that both fits my needs and also can keep up with update releases. In the meantime I try to build my sites only with Native Elementor to avoid things breaking, which is a bit of a pain in the buttocks… One thing is for sure, after having tried and in many cases worked with almost any visual builder out there, Elementor is by far the best out there! A bit off topic but IMHO what would make Elementor perfect and a game changer in the industry would be to have a visual interface with “free” breakpoints settings like some CSS visual interface plugins have (Microthemer / CSS Hero)… ? It seems to me that most add-on packs just mimic existing modules from Elementor (Pro). And every new module released with Elementor (Pro) will create new headaches for 3rd party developers with similiar offerings. Who needs dozens different(?) Pricing Table or Icon List modules after all? But there are still opportunities. I could use a decent data table module for example. Maybe it’s hard to implement, but please keep trying (veterans of web design will remember Claris Home Page, a WYSIWYG HTML table editor from 1994). Is Jetelements for Elemento a option to use Ben? Does Elementor have any plugins that can access a CUSTOM database. It is created in PHP Admin. It has 2 tables and will need a little bit of logic between the two. I just need some way to tie it into the website. Piotnet Addons For Elementor – PAFE https://pafe.piotnet.com/ This genuinely looks like one of the best plugins I’ve seen for actually saving time in hand-writing CSS ! You can Responsive Border Width, Responsive Background Position,… Lot’s of things people want. Is there a plugin or widget that permits scheduling based on day of week and time? I have a restaurant application coming up that I would like to use Elementor and OceanWP to show images and information on their daily specials. There are 3 different specials each day of each week. Specials start at closing time the day before and run to the closing time of the next day. Hm…I had some errors in few plugins from this list. But, for booking I use this one (https://wordpress.org/plugins/sagenda-calendar/) Big “”+”” for me was simplicity in installing and editing. Try this one, Maybe it would help? Hey guys, I wanted to ask: Is there a way (addon) that will make your WP site into a membership site. Something like restrict content pro but for Elementor? Thanks in advance! We cannot recommend a specific addon, but you can post your question on our Facebook community, I’m sure some members have experience with that. Thanks for the info, Matan! We’ll surely check there for answers. We have 1000+ images but elementor’s “Insert Media” has no options to filter on anything? Tried all sorts of WordPress plugins providing categories, but none showed filter functions in elementor! Looked at ACF, PODS, Tools, no features to filter images, just adding other post types. You can direct the question to our Facebook community members, I’m sure they’ll be able to assist. This article s good, but it desperately needs to be updated.